Relics from the Jomon era, location names which originate from the Ainu language, sites of the Edo era herring boom, mines from the prosperous coal mining years of Showa; all are evidence of the ongoing presence of human activity in the Rumoi Area. Our ancestors adapted and persevered through harsh environments and the changes of time. Even now, people who are proud to call the Rumoi Area home are imbued with a unique brand of robust vitality; perhaps this is something which is absorbed from the surroundings. The 8 municipalities of Rumoi Sub-prefecture and local boards of tourism have joined together to communicate the appeal of the Rumoi Area via The Hokkaido Tour Routes Project. This initiative was begun as a unified project to facilitate tourism within this region. This magazine is one step within this project. We hope that this information will allow others to access and enjoy the “common” local lifestyle, for an uncommonly unique experience. There is a general outline and route map at the beginning of each theme. 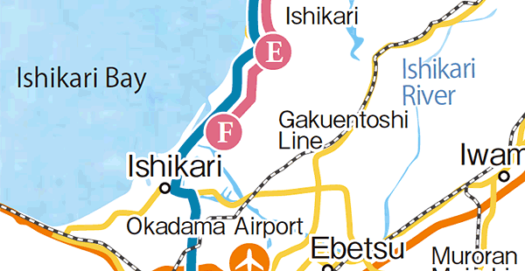 Routes with starting points in Sapporo, Asahikawa and Wakkanai are introduced here. The color-coded, circled numbers on the route maps are introduced in more detail in the pages which follow. 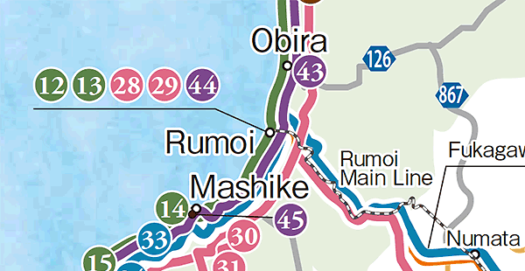 The color-coded, circled letters indicate locations which are outside the Rumoi Area. We hope this information is useful as you plan your route. Information on in-route shops, facilities and points of interest are listed within each theme. Please use this as you plan your trip. *The information was recent as of December 27th, 2017. Please be aware that facility and business hours may vary. These are individual illustrated maps for each of the 8 municipalities in the Rumoi area, as well as the islands Teuri and Yagishiri. Please use these as you explore various stores and attractions, both on foot or otherwise. The areas outside the maps are not marked by circle number, so please read the detailed information on each area before you visit. *The information concerning the Rumoi Federated Board of Tourism Ororon Maps is recent as of December, 2017.